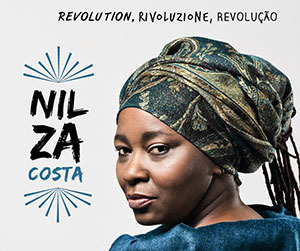 Nilza Costa is an extraordinary Afro-Brasilian musician. She has a riveting voice that—in the Western music realm would be considered contralto—is mesmerising because of its sensuous almost physical quality in which Ms. Costa does not so much as sing the words of her songs as licks them and then tosses them out with an almost beautiful contempt and so steeped in sardonicism and irony that they pierce and hurt the consciousness. In her album Revolution Rivoluzione Revolução she is strident in tone, yet her music echoes with an African regality and grandeur that informs the music of Brasil. Brasil is not unique in Latin America for being influenced by African music and dance, but memories are short and many Latin cultures, such as Argentina, are even in denial about the influence of Africa. Brasilian music (and dance) without the African inspiration is simply impossible. Brasilian atabaque—the ganza, marimba and cuica as well as the berimbau (the soul of capoeira is almost certain to have come from the musical bows of Southern Africa) all have African origins. Nilza Costa’s music also further glues Brasilian music to its African origins. Her sambas, a dance form derived from of semba, (again from Bantu Southern Africa) are subtle and like the shuffling of dancing feet in and among a circle of friends and tribal communities. Ms. Costa’s music also recalls the fetishist chants and dramatic dances like Congos, Congadas and Quilombos, the nasal twang in the Brazilian singing voice, some choreographic steps are also Afro-Brazilian musical manifestations. Nilza Costa’s rich and eclectic sound is boundless. Although it echoes with the rhythms of Salvador de Bahia, where she was born, it pulses and beats with a heart that beats for Africa, this rich (African) heritage underpins the expressions of Candomblé, Capoeira, Samba, Maculelé and Cantigas de Roda. Her notes and phrases are wrought with a voice dense with the emotion that is born under a Bahian sky but harkening back to Africa. 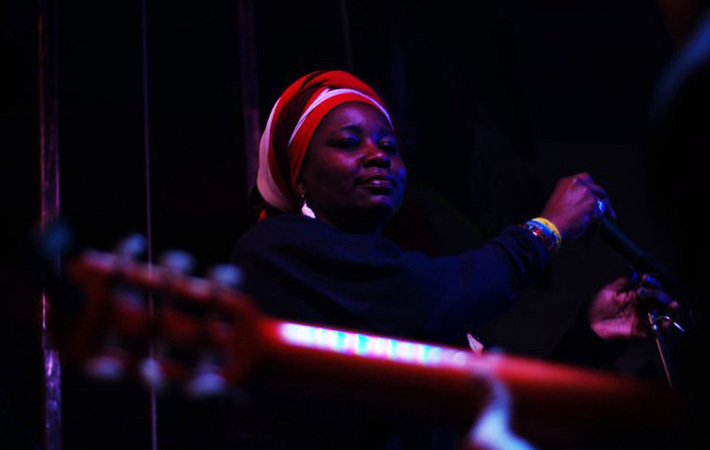 The lasting impression of her vocalastics is deeply integrated by the gravitas with which she brings to her source material—“Africa” and “Afoxé do Amor” spring immediately to mind—and stand out almost as improvisational as if they were created on the spot. Ms. Costa can be rustic and emotionally sweet too as in “Soberanía Popular” and she can also breathe fiery dialogues with the instrumentation as she does on “Blues de Yansa”. Her singing can also be almost uncharacteristically lithe as the lines seem to flow like bubbling brooks. And finally, without sacrificing power and speed, she mines the lyrics of her deeply Africanised and beautiful music with delicacy and precise elegance. In fact, it feels as if Ms. Costa ultimately liberates the music`s ebb and flow with grace and fortitude. And this is perhaps the most profoundly beautiful aspects of this heart-stopping record by someone who is unabashedly African in her approach to Latin American music. The record is utterly memorable. Track List: Obanixa; Africa; Filhós do Vento; Soberanía Popular; Blues de Yansa; Pedra do Pedro; Afoxé do Amor; Ispiraçao Primeira; Calundu; My Troubles; Lettera della Terra. Personnel: Nilza Costa: voice; Peppe Siracusa: electric guitar (4, 10,11); Giancarlo Bianchetti: cavaquinho (3, 7); Massimo Donno: acoustic guitar (4, 10); David Garatoni: acoustic bass, electric bass (11); Pippi di Monte: electric bass (11); Roberto Rossi: drums and percussion ( 1 – 10), Manuel D. Monteiro: drums (4, 10); Giovanni B. Maraschini: drums (8, 11); Christian Vistoli: percussion (4, 10); Daniel Cau: tenor saxophone and bassoon (5, 8); Carlo Atti: alto saxophone (10); Gianluca SIa: soprano saxophone (2, 4); Claudio Cadei: violin (4, 6); Carlotta Monti: background voice (2); Silvia Donati: background voice (5); Francesca Biancoli: background voice (10); Carime Annunziata: chorus (4); Alberto Irrera: chorus (7); Marco Benatti: sound effects and electronics; Stefano Artini: sound effects and electronics (11); Jorge Viera: electronics.